The development of affordable battery storage is increasingly being looked at as an indispensable component of sustainability. Let's take a closer look. Why Is Battery Storage So Important? Clean, renewable energy sources are needed to help create a sustainable society. They must displace our current dependence on more problematic sources of power such as oil, natural gas and uranium. The trouble with such renewable power sources is that they might not be produced at the time when most needed—during periods of peak energy demand. The creation of energy from such sources depends on environmental conditions. Wind energy is harnessed when it is windy, and solar energy creation is dependent on sunlight. Such challenges require a storage solution such as lithium-ion batteries. They enable renewable energy generation to be stored until required. "It serves a dual purpose. Firstly, it facilitates the integration of intermittent renewable energy sources, whilst simultaneously opening the door to generating income for prosumers. The dual purpose of battery storage is driving mass-market adoption of residential storage beyond 2020. By 2025, we can expect residential storage to be an integrated and essential component of all renewable energy projects." Ramachander sees a future where “prosumers” (individual energy producer/consumers) will install individual energy storage systems, allowing them to achieve significant savings, and allowing them to generate revenue by selling surplus power back to the grid. The cost of lithium-ion battery production continues to fall. Elon Musk of Tesla believes that lithium-ion battery costs will fall to $100/KWh by 2020, down from a price of $1,000 only as recently as 2010. Bloomberg projects battery storage costs to drop below $50 by 2030. Current cost is in the $200 range. As the cost drops, alternative energy sources will become increasingly competitive with conventional energy projects. Increased demand for battery storage can be influenced by government policy, which in turn can result in increased production and falling prices. Several states have adopted storage mandates and regulations, including California, Hawaii, Maryland, Massachusetts, Nevada, New Jersey and Oregon. Federally, a 30 percent Investment Tax Credit is still available for investment in energy storage, as long is it is associated with renewable power generation project. California has adopted the most aggressive program to date, requiring 33 percent of energy from renewable sources by 2020, and 50 percent by 2030. Lithium consumption is expected to increase 42 percent between 2017 and 2020, driven by increased battery production. Price increases in the near term are expected to be followed by decreases from 2019 onward as lithium production increases. Battery production is also highly reliant on cobalt and nickel. Cobalt prices doubled between 2016 and 2017, with lithium-ion battery production fueling 49 percent of demand in 2017. It is predicted to grow to 61 percent by 2022. The growth of electric vehicle (EV) production is driving lithium-ion battery production. EVs currently make up only roughly 1 percent of all vehicles, but that will change rapidly. According to a McKinsey & Company, the EV segment of the light-duty vehicle market could reach 20 percent by 2030. 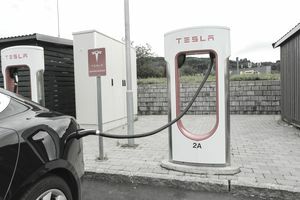 Tesla has stated its mission as accelerating the global transition to sustainable energy through “increasingly affordable electric vehicles and energy products.” To support its goal of producing a half million cars annually by 2018, Tesla, in cooperation with Panasonic, has created its Gigafactory battery production plant in Nevada. Panasonic, the world’s largest producer of lithium batteries, announced in March 2018 it had begun production at a new $400 million plant in China. CATL, or Contemporary Amperex Technology, a competitor in the lithium-ion battery space, also announced its intention to build a giant factory in China. Completion of the project would boost its capacity to 50 gigawatt-hours by 2020, versus the 35 GWh of batteries produced at Tesla’s Gigafactory. A Bright Future for Storage Batteries? Storage batteries offer a viable solution for storing intermittent energy supplies associated with renewable energy. Cost is lowering as production increases, and they provide hope for a future that is tied to clean renewable energy. There will be resource constraints to be managed, however. With EV production increasing thirtyfold by 2030, lithium demand will increase drastically. The Earth has significant lithium reserves, but more mines will be required to come online quickly. Another important metal used in lithium-ion battery production is cobalt. For example, a smartphone typically contains 1 gram of lithium and 8 grams of cobalt. More than 40 percent of mined cobalt is already consumed by the lithium-ion battery market, even though the EV market is still very small. With each electric vehicle requiring 10kg of cobalt, rapidly escalating production means that cobalt requirements will increase substantially. In spite of such concerns, the combination of renewable energy sources and battery storage seems like the best option going forward for eliminating dirty energy production. How China's Renewable Energy Model Could Benefit the U.S.